5 May 2017, at 12:00a.m. Porcine Reproductive and Respiratory Syndrome Virus (PRRSV) is one of the major pathogens in pigs that have a significant economic impact on the swine industry worldwide. Vaccination against PRRSV has been demonstrated as an effective tool to control clinical signs related to infection. The aim of the present study was to evaluate field efficacy of a new PRRS genotype 1 modified live virus vaccine (Ingelvac PRRSFLEX® EU) in piglets at four weeks of age. The study was conducted in a fattening farm in Spain with a history of PRRS infection. A total of 1,364 piglets were included in the study and assigned to two groups (vaccinated and non-vaccinated control animals). Piglets were followed for average daily weight gain as well as clinical signs, mortality and concomitant treatments. Field infection with PRRSV occurred either before vaccination or shortly after. Peak viremia occurred around four weeks post vaccination. 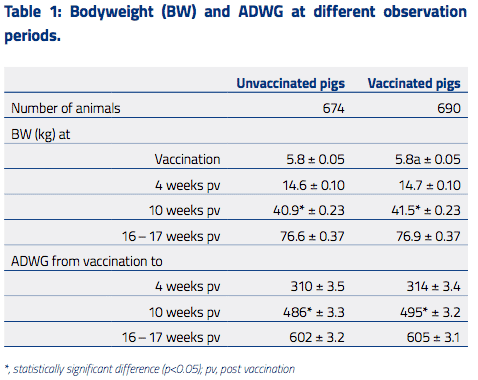 Vaccinated piglets showed a significant increase in average daily weight gain (ADWG) during peak of field infection (495 vs. 486 g/d). In addition, the group of vaccinated piglets showed a significantly reduced mortality rate (4.9 vs 6.1%) and frequency of concomitant treatments (18.6 vs. 23.0 %), respectively. Furthermore, the proportion of pigs showing any abnormal clinical sign at least once at any of the examination time points was significantly lower in vaccinated pigs than in control pigs (4.2 vs. 8.3 %), with special emphasis on respiratory signs that were significantly reduced in vaccinated piglets as well (2.3 vs 4.7%). The importance of stabilizing the breeding herd to reduce the vertical transmission of PRRS to piglets is critical to the long term disease control.